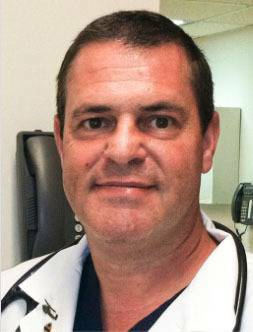 Dr. Tim Saloom is the Medical Director of Integrated Acute Care Services at Somerset Hospital in Somerset, PA. Dr. Saloom received his undergraduate training at Slippery Rock University of Pennsylvania, where he received a BA in Psychology. He then spent a little more than six years in the US Army as a Captain and an AH-1S Cobra attack helicopter pilot. After his military service, Tim completed further studies at the University of Texas in San Antonio. He earned his medical degree from Jefferson Medical College in Philadelphia, PA. He completed his residency at the Latrobe Area Hospital in Latrobe, PA. He is an outdoorsman and is considered to be an above average Sporting Clays Shooter with several local amateur wins. He has 4 children ages from 18 years to 4 years. When not involved with his children, working in, or managing, the ER at Somerset, Tim also is a Special Deputy Sheriff for Fayette County and is the volunteer director of Fayette County Tactical Medical Team. This team provides on-site emergency tactical medical support for local and federal law enforcement agencies.